Rosacea is a common skin condition that leaves those affected with red bumpy skin, and often feeling uncomfortable. WebMD says the skin condition doesn't just leave your forehead, cheeks, and chin read and covered in little bumps - it can also leave your eyes dry, and sore. Anyone can develop rosacea, but it most commonly occurs in middle aged white women. Because rosacea leaves little bumps on the skin, it can be mistaken for acne or even an allergic reaction. The Mayo Clinic says the skin condition also comes in flares - so it might appear for weeks, or even months, then disappear altogether. If rosacea is left untreated, the condition can worsen, so it's important to understand the signs and symptoms so you can talk to your doctor and get proper treatment. 1. Redness in the face: Rosacea usually causes redness in the middle of the face, usually caused by tiny blood vessels in the nose and cheeks to becoming visible. 2. Small red bumps: The bumps might resemble acne, and even contain pus like pimples. 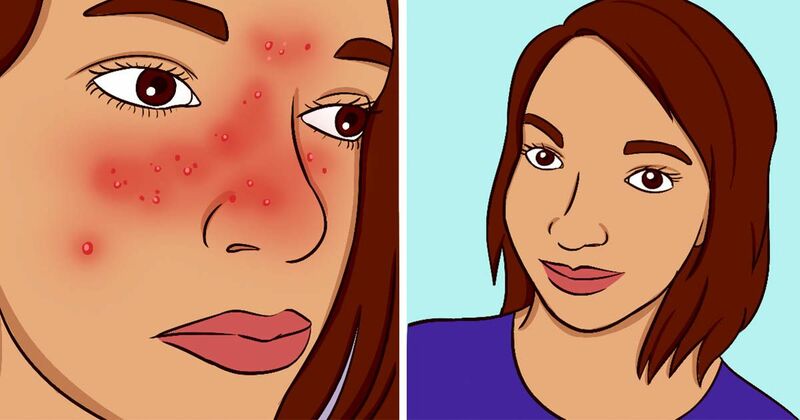 The bumps can also cause your face to feel tender, and warm. 3. Irritated eyes: Irritated, swollen, and red eyes affect about half of rosacea patients. 4. Swollen looking nose: Somewhat rare, and more common in men, rosacea can cause the nose to look bulbous (a condition known as rhinophyma). If you experience any of these signs of symptoms, you should see a doctor or a dermatologist for diagnosis, and proper treatment. Rosacea can't be cured, so WebMD explains that it's about managing symptoms and avoid flares and triggers. - Protect your face. Stay out of the sun, and when you can't wear sunscreen, and a hat.